You can give your customer many different options when booking your event online or offline. The ticket types available can be determined when setting up your entry. Standard tickets - One ticket entitles your customer access to one of your events. 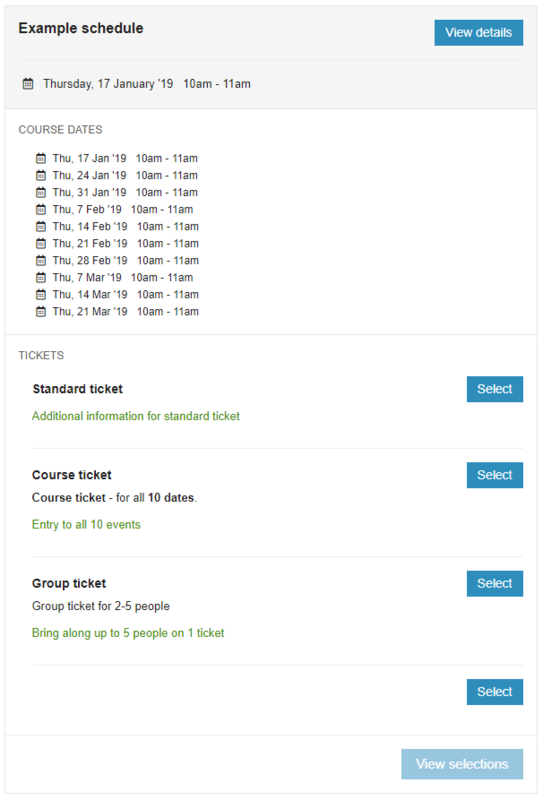 Course tickets - Your customer purchases a ticket to every event on the entry it is attached to (available if the entry has more than one date and does not continue forever). Group / Family ticket - A ticket which permits access to more than one person (capacity defined by you). Class passes - Your customer purchases a block of passes (e.g. 5 classes) and is permitted to use these passes within a validity period defined by you (class passes are set up via Discount options). Block booking discounts - Your customer receives a discount when they purchase multiple events in one transaction, this can be limited so they only receive discounts when buying tickets for separate events (Block booking discounts are set up via Discount options). Early bird tickets - Your customer receives a discount when they purchase a ticket to your event within a specified advance period.